Do you miss your old Windows 7 games? Well, you can get them back! 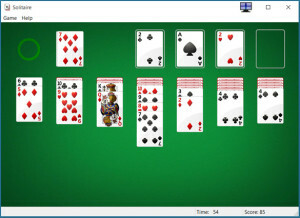 Do you love the “old-style” games like Solitaire, Hearts, FreeCell and others that you used to be able to play with Windows 7, but can’t find them in Windows 8.1 or Windows 10? Well, those beloved old-style games were removed in the most recent versions of Windows and replaced with “modern” versions that you have to download from the Windows Store. I happen to prefer the old-style games myself. If you prefer them as well, you’ll be happy to know that our friends over at Winaero have an installer that will put those wonderful Windows 7 games on your Windows 8.1 or Windows 10 computer! 1 – Visit this page on the Winaero website. 2 – Ignore all the “Start Download” buttons and links (they are actually ads) and scroll down until you see a link titled “Download Windows 7 games for Windows 10”. Click that link. 3 -After the zip file has been saved to your computer, right-click on the zipped folder and click Extract All. 4 – Open the newly-created folder and double-click on the Win7GamesForWin10-Setup.exe file, then follow the prompts to install the games on your system. 5 – After the games have been installed, simply select the game you wish to play from the Start Menu. That’s all there is to it. Now you’ll be able to skip the “modern” games in the Windows Store (along with their ads) and play the same games you enjoyed back when your machine was running Windows 7! Bonus tip #1: This post explains how to speed up your Windows 10 PC by disabling ‘Pretty’ features.